Kurihama Flower Park is not safe! Actually, it is. The giant Godzilla that towers above the play area doesn't breathe fire. Heck, it doesn't even move. But, the kaiju does have an unusual secret. This nine meter tall, five ton Godzilla is actually playground equipment. The monster's tail doubles as a slide for children. However, to enjoy this piece of playground equipment, children must climb stairs that lead directly into Godzilla's open crotch. Memories of that Pikachu bouncy house come rushing back. 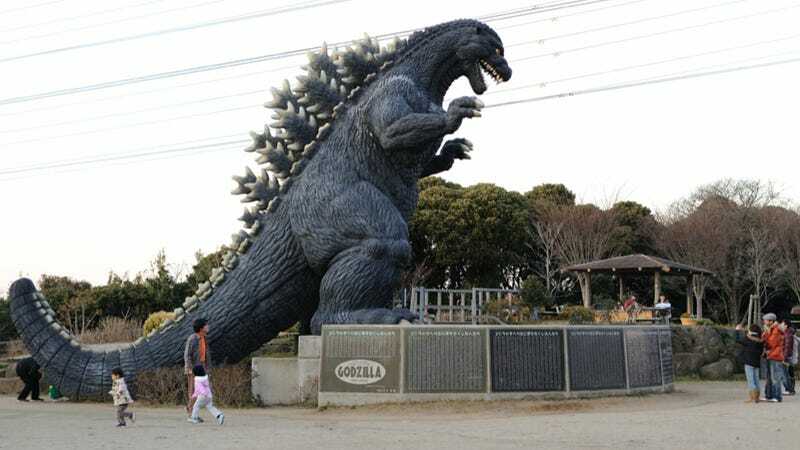 The reason why there's a huge Godzilla at this park in Kanagawa is because in the first Godzilla film, the beast emerged out of the ocean at a nearby beach, known as Kanonzaki. To mark this, there was a Godzilla slide erected at the beach in 1958, which probably inspired other, far less impressive Godzilla slides on Japanese playgrounds throughout the country. The slide at Kanonzaki fell in to disrepair by the early 1970s. You can, however, still see "Godzilla's footprint" at the shore. A new, far more impressive version of the slide (top photos) was built at nearby Kurihama Flower Park in 1999. It still stands today. Toho Studios actually oversaw the slide's construction, meaning that Toho signed off on the Godzilla crotch entry, making it official. That's incredible. It also means that giant Godzilla pre-dates the more recent "giant statue" trend. Besides giant Gundam, Japan has seen giant anime heroines, giant robots, and even a giant plastic model box in the past few years. Bigger is better. Yes, even if you have to crawl into a monster crotch.